It may not have happened yet . . . but it still could . . .
Having just completed the first order of the year for five snow blades for fixing to SCAG SWZ Zero-Turn mowers, STM are gearing up for further sales to counter the projected bad spell of weather in the coming months. It makes great sense to be able to put the machines to work outside the grasscutting season, and the changeover is quick and easy; removing the standard grass-cutting deck and installing a blade takes less than half an hour. 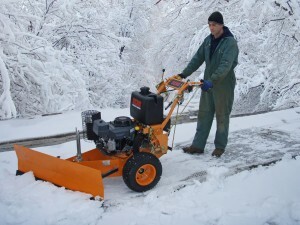 The unit comes with height and angle adjustment, a jockey skid for ease of manoeuvering, and a replaceable rubber strip at the base of the blade. 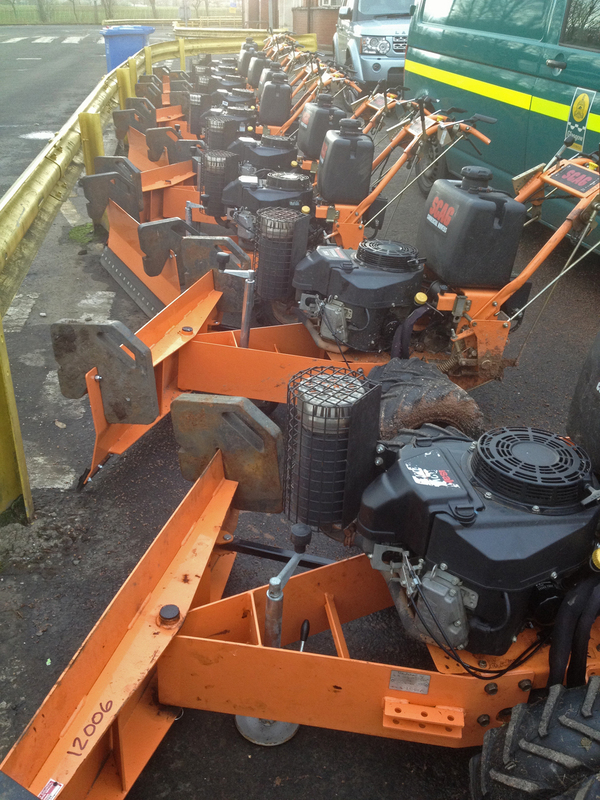 We spoke to Jack Aikman of the Land Environment Services division of Glasgow City Council and he sent us a picture of part of their huge fleet of SCAG mowers already equipped with STM snow blades, ready for what comes. STM also have the Hilltip salt and brine spreader systems available. The current range from STM features two versions: the smallest version – the 100, is a spreader only – for fitting to an SUV tailgate, and the 550 is for fitting to the whole carrying deck on an SUV. The 550 has twin features: a hopper for dry product [e.g. salt] or a bowser for liquid, e.g. brine. There is a spraying head that can be positioned for continuous operation or it can be detached for operating by hand.